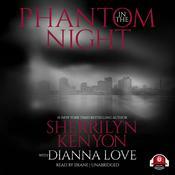 For years, fans have been clamoring for an all-in-one collection of #1 bestselling author Sherrilyn Kenyon's novellas. At their enthusiastic behest, we have delivered this brand-new short story collection, Dark Bites, including stories previously exclusive to Sherrilyn's website, as well as an all-new, never-before seen Dark-Hunter story! Sherrilyn Kenyon takes readers from the Dark-Hunters to the demigods, from Dream-Hunters to demons, and everything in between. Dangerous and exciting, each story is one thrill ride after the next, proving time and again how Sherrilyn has captivated millions of readers worldwide. Now, readers are invited to go deep into Kenyon's rich and imaginative world and experience the heart-racing moments that never stop coming!